Let's face it. There are a lot of folks with a nice camera and a decent computer. So why "Turnip?" Why Jim McQuaid? Well, yes, you get the nice camera(s) and all the stuff that goes with it. But you also get "business to business, high tech" Jim McQuaid. Jim who ran Marketing Communications for the DSP division of semiconductor pioneer Analog Devices. Jim who ran Documentation, Training and Marketing Communications for a network test equipment company. Jim who has shot video in the OR at Duke Hospital. If you have a technical message of any kind, Jim will understand and support that message. Oh, and you get "Indie Film Cinematographer" Jim McQuaid, the guy who has made twenty short films, won awards, worked on projects small and large. Check out his eye here. And then you also get "life experience with people" Jim McQuaid. The guy who has taught high school kids, college kids, worked with ex-convicts and run an Oral History program for two years. If the quality of your video communication matters, you want more than professional lighting, sound and editing; you want someone who understands your message and how to craft it into the most effective video. Our experience means we understand the ins and outs of messaging and positioning. Our filmmaking experience means that we understand how to tell the story of your product or service. As the menu choices above suggest, a lot of our work is in a few key areas. We've crafted web videos for promotional and informational purposes. These have included original scripted material and actors, recordings of lectures and interviews of all kinds. We've shot in people's homes, in auditoriums and on location in the forest. We've created training videos about complex policies and everyday ergonomics. Some have required staging specific situations to illustrate how workers should deal with them. 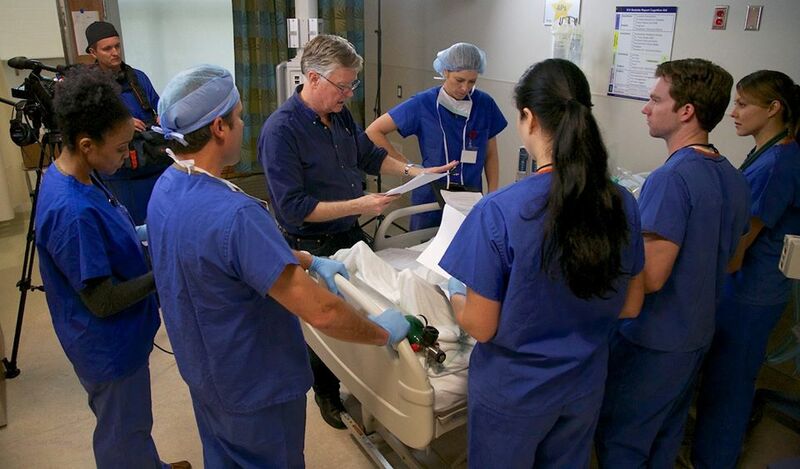 Here's a photo shot by crew member Todd Tinkham of a major project about Patient Handover procedures for safety. Others have used voiceover narration. We have spent time in the classroom and we've led sales training sessions, so we know what works for a many different kinds of audiences. We have recorded small and large theatrical performances for sale to audiences and fans. We've shot audition videos for a variety of actors, drawing on our film experience as needed to create the best possible audition. Contact us and we can help you. All our work is quoted on a flat fee basis - no creeping fees! Here's a quick overview of some of the other kinds of video production we've been involved with. Of course, our film work required us to solve interesting challenges as well. Check out www.turnipfilms.com. Helped a psychologist outfit his office to record sessions without putting a microphone on his clients and then edited the results into a confidential teaching tool. Shot stock car races (Operating a camera in Turn Three for 200 laps!). Worked with neurobiologists to record scientific experiments for conference presentation. Helped script and then produce a video for a local church used in their membership orientation. Worked with Duke University Medical Center personnel on an anesthesiology training video. We've done a lot of different projects and, combined with our film work, we have solved a lot of video production problems efficiently and cost-effectively.